NVDA is perhaps the hottest semiconductor stock this decade. From the ashes of the 2008 crash, the stock has risen an impressive 3000% and perhaps more. Who would have thought that a stock that is only trading at a mere $6.00 after the financial crisis is now trading at $212 in less than 10 years. This fantastic rise surprises many people. Some may have even condemned this stock when it was trading at $10.00. How could this stock have risen so much without us realizing it? While there are many fundamental reasons, one thing is certain: The stock price is trending up and shooting to the roof. To check out the fundamentals of a stock, I usually head over to investing.com's fundamental page. You can go to NVDA's financial ratio page by clicking on the link. 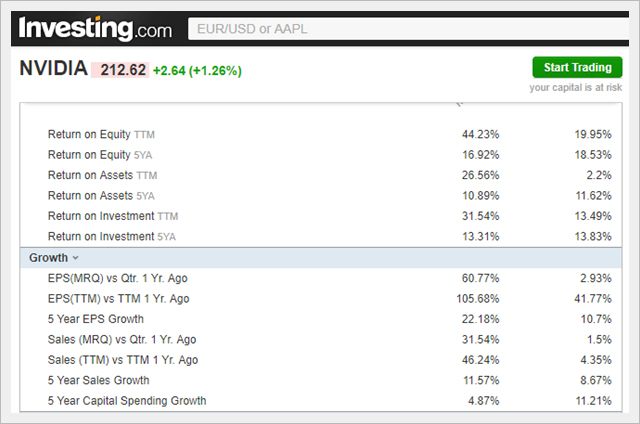 The Return on Equity (Trailing Twelve Months) is 44.23% and that is mighty impressive. Return on equity (5 Years Average) is also very good at 16.92%. The Earnings per share (Trailing Twelve Months) compared to a year ago is also very impressive at 105.68%. 5 Year Earnings per share growth stands at 22.18% and 5 year sales growth is at 11.57%. Well, at least earnings per share and sales are growing. All these financial ratios are very good and show that the company is stable and growing. That is just part of the equation to a successful stock. Because the stock market is forward looking, the story of the company and the anticipated future earnings also play a big role in determining the share price. As a trader, I still believe the best way to figure this out is to look at NVDA's trend. Right here in Dstockmarket.com, I am a big believer in trend following. Ever heard about the maxim "The Trend Is Your Friend"? This Wall Street wisdom is truer than any maxim about investing or trading that you will ever read. The concepts of trends is very closely related to the concepts of the 4 stock market stages. You see my friends, a stock will always go through the 4 stock market stages. You will make the most money in stocks by buying stocks that are in a Stage 2 uptrend. To learn more about market stages, read The 4 Stages That Every Stock And Market Goes Through. After reading the article, you will be able to understand why NVDA went up so much. Well, spoiler alert : NVDA went up so much because it was in a Stage 2 uptrend. It followed the trend and continue to make higher highs and higher lows. The chart above is the monthly chart of NVDA. If we take a look at the long term charts, it is easy to see that Nvidia had come along way since the 2008 crash. The stock had a big rise from 2006 to 2007 and in 2008, it suffered a big crash. The low it made in 2008 was $5.75. From a low of $5.75 in 2008, the stock has risen to $212.99 in November 2017. That is an impressive return. If you were to put $500,000 into the stock, it would turn into $18.5 Million USD. Well, that is in hindsight and not many people will have the courage and insight to invest such a heavy amount into the stock. Throughout 2008 to 2014, the stock actually had many wide swings up and down. 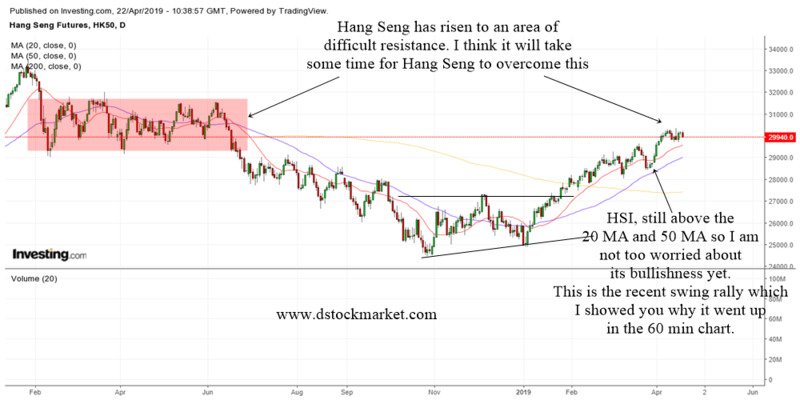 Despite the volatility, an observant chartist would be able to see that the stock was making a very large monthly symmetrical triangle pattern. 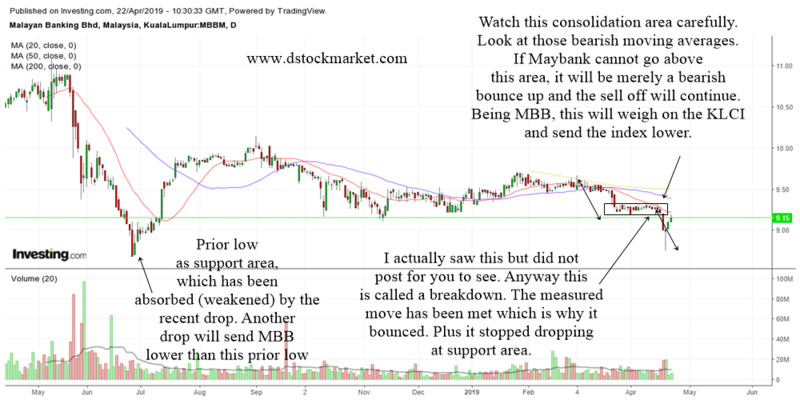 This chart pattern starts with a very wide and volatile move and as it progresses, the movement of the stock starts to converge. You can actually draw two trendlines connecting the highs and the lows of the entire pattern. 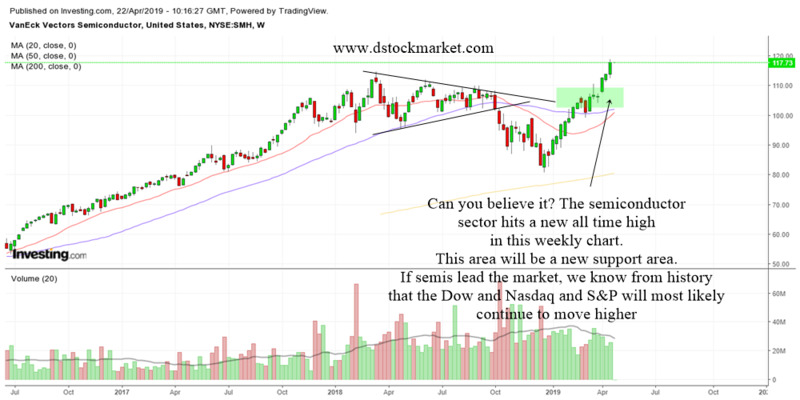 As the stock reaches the tip of the triangle it will break out. 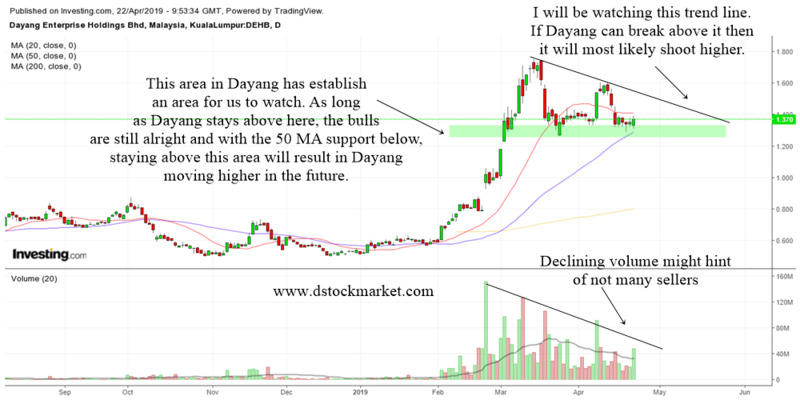 From 2014 to mid 2015, the stock drifted higher slowly. The impressive move came in mid 2015 to 2017 where the stock exploded higher non stop. 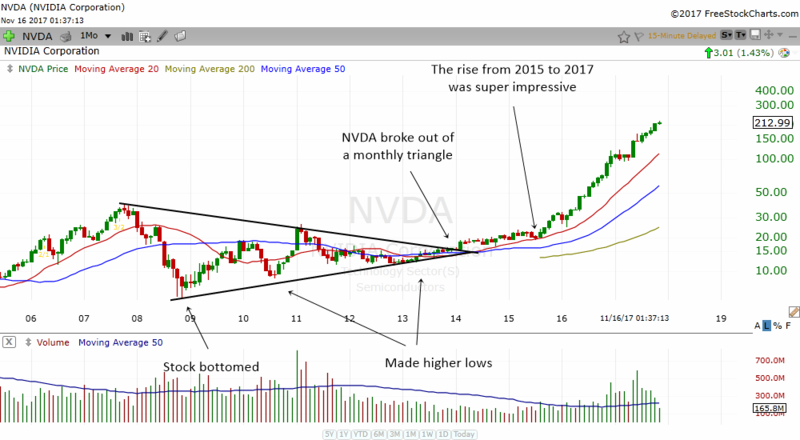 From 2014 onwards, NVDA was already in an uptrend. And the maxim "The Trend Is Your Friend" is very true with NVDA. The stock followed the uptrend and continued to move higher. Prior to 2014, the stock had already shown signs of bottoming. When a stock starts to make higher lows, it tells us that the stock has bottomed. One of the ways that traders and investors can determine if the stock is in a nice uptrend is to check the moving averages. I usually like to use 3 moving averages. They are the 20 MA, 50 MA and 200 MA. If you take a look at the monthly chart of NVDA above, you will notice that in 2015, the stock's price was above all 3 rising moving averages. They form a very smooth rise with the 20 MA (red line) above the 50 MA (blue line) and the 50 MA above the rising 200 MA (yellow). This is a picture of a strong trend and when you see a stock above all its 3 monthly 20 MA, 50 MA and 200 MA, you should be very bullish and follow the trend. 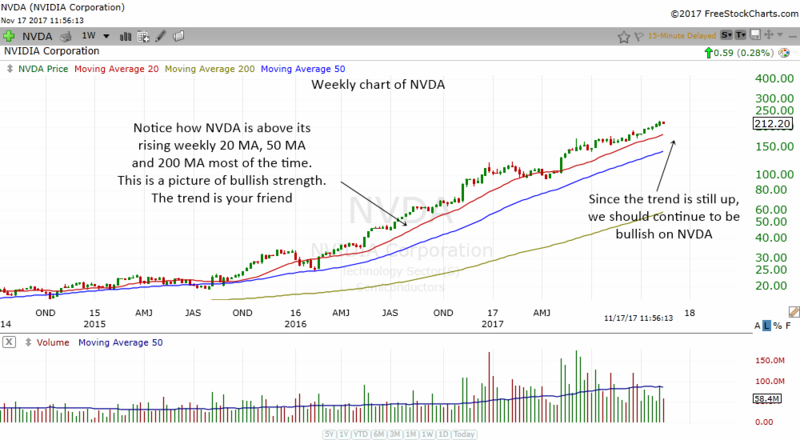 The chart above is the weekly chart of NVDA. The stock is moving upwards from the lower left to the upper right. It is trending higher. Which is why we should continue to be bullish on NVDA. If you look at the weekly moving averages, you will notice that the stock is above its rising weekly 20 MA, 50 MA and 200 MA. This is a picture of strength. When all 3 moving averages are rising nicely, it shows us that the long term trend for NVDA is up. Which is why we should continue to be bullish on NVDA. Investors should look for opportunities to add to NVDA. They can buy the dips or buy the break outs. Traders should look for trading opportunities to the long side. While the concept of trend following is simple, it is extremely powerful. 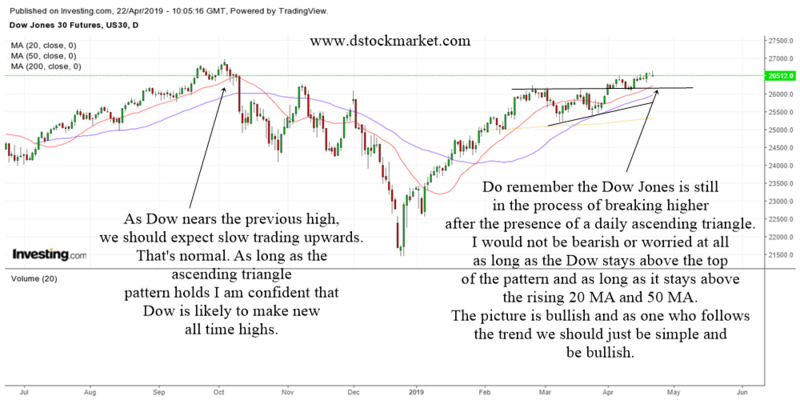 From now on, find stocks that are in a long term uptrend. Perhaps you should make it a rule to only invest or trade stocks that are in a long term uptrend. When you invest and trade with the trend, your odds of success will be higher. You may even find the next NVDA!